Remember, pre-cut home packages are not necessarily all the same! We suggest that you compare the packages very closely to determine what materials are being offered, the services performed by the company and the stability and credit worthiness of the company. If there is a large difference in the package prices, be cautious! There must be a good reason! 1. How long has the pre-cut home company been in business? 2. How many homes (of the type you desire, i.e. log, timber frame, etc.) have they shipped? 3. Will they provide names and telephone numbers of customers for you to contact as references? 4. Will they provide you with bank/financial strength references? 5. Are the logs being quoted up to 40' long or are they short logs with numerous splices? 6. Are the logs graded and stamped in accordance with Timber Products Inspection, Inc. standards and is each log from the heart of the tree? Be careful not to get sapwood logs. 7. Are the sill logs resting (starting) on the foundation or on the sub floor? How many courses of logs are they quoting? If the logs rest on the subfloor one course of logs is being omitted and you will have to spend additional money to cover the floor joist headers. More logs provide more second floor space. 8. Is the roof system a built up roof or a truss roof? Built up roofs should include a finished interior underside (usually 2x6 T&G wood decking), heavy timber rafters and ridge beams, rigid insulation (R-24 or better), 1/2" minimum thickness plywood sheathing and 30# felt paper. Truss roofs (flat or cathedral) usually do not have finished interior, finished undersides or insulation. Normally this must be provided and installed by the owner at added expense. Be sure to check this! Truss roofs are initially less expensive. 9. What grade roof shingle is being provided? Are the windows and doors stain grade or paint grade? Hearthstone automatically prices 300# architectural high definition shingles to look as similar to cedar shakes as possible. Others may provide 20 or 25 year flat (low definition) shingles. We quote Douglas Fir clear stain grade. Well-known by architects and designers for their high quality. 10. Has a log settling and/or shrinkage system been engineered into the package? All heavy timbers will settle and shrink (or swell) depending on the moisture content in the air, regardless of being kiln dried or not. Look at solid kiln dried wood panel doors! That is why the panels in the door frames float, to allow for this movement. Hearthstone has engineered floating window and door jambs into its system along with adjustable load bearing post supports to eliminate settling and shrink problems. 11. How are the logs tied together? CORNER SPIKES ARE OUT-STEEL THROUGH BOLTS ARE IN! Hearthstone uses steel through bolts with huge compression springs, at corners and between window and door openings. This system was originally developed for seismic areas. 12. How do you place electrical wiring in the exterior log walls? Do you have to manually drill each log as they are placed one log on another? Or do you have to route out the logs after they are stacked? Hearthstone provides several vertically aligned predrilled 1" wiring holes in each log course. Wiring up from the subfloor and vertically through the logs and then horizontally to any switch or outlet box is extremely easy. Boxes may be placed in the spline board or in the log faces. Later on, additional outlet and switch boxes may be easily added as needed. Other systems can cost more to wire. Our chink spaces are heavily insulated and our building systems are approved by the National Model Energy Code and the North Carolina Energy Code. 13. Who erects the logs? Hearthstone has factory trained and certified home erection specialists available on a national basis. These teams have erected hundreds of homes. This is where experience really counts and why we can give you our unconditional structural guarantee! 14. What services do your sales representatives offer? Your Hearthstone Representative will work diligently with you and your building contractor throughout the designing, planning, pricing, siting, delivery, construction and move in phases. We are specialists who are available whenever you need us! Mountain Construction are North Carolina Builders that specialize in New Home Construction. We also can provide Remodeling services, and are happy to work with your as Cabin Builders on your next cabin. 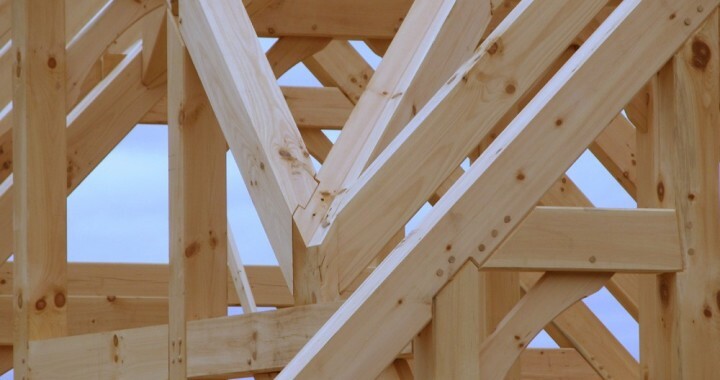 Over the years, we have accomplished a great deal as Timber Frame Builders. Please contact us for more information.